But I think it deserves a bit more attention. 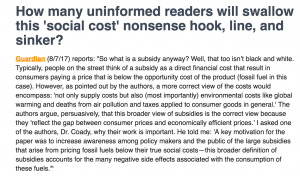 As the above excerpt indicates, Abraham’s article is a paean to a study that seeks to redefine subsidy. According to the study’s authors and to Abraham, rather than subsidy meaning a benefit given by the government to groups or individuals, usually in the form of a cash payment or grant, the term should encompass “environmental costs like global warming” that are not taken on by an industrial outfit. Here’s the thing though: we already have a well-known term in the economics nomenclature for this concept: externality. An externality is a side effect or consequence of an industrial or commercial activity that affects other parties without this being reflected in the cost of the goods or services involved. Externalities can theoretically be negative (think: local water pollution) or positive (think: a neighbor’s garden, which you do not pay to maintain, yet from which you nevertheless derive visual and olfactory pleasure). But the costs and benefits from externalities are notoriously difficult to assess. Now, I haven’t yet had the opportunity to wade into the study Abraham is promoting, but I think we can safely assume the future costs it attributes to the fossil fuel industry rest upon the dubious “social cost of carbon” (SCC) or another similar metric. The SCC and its counterparts, however, are far from scientifically valid. [T]he use of the SCC as an input into federal regulatory actions is totally inappropriate. The Administration is treating the SCC as if it is a scientifically valid, objective fact of the external world, akin to the charge on an electron or the boiling point of water at sea level. However, the SCC is no such thing, at least in our present state of understanding. Rather, the SCC is an arbitrary output from very speculative computer models. It can be adjusted up or down as the analyst wishes, simply by changing a few key parameter choices. Simply by adjusting the parameter and modeling choices in plausible ways, a knowledgeable economist can generate SCC estimates that are very high, very low, or even negative—meaning that carbon dioxide emissions actually shower “positive externalities” on humans beyond the direct benefits to the emitters, and therefore should (according to the Administration’s logic) receive federal subsidies. As we suggested with our newsletter commentary, there’s a measure of equivocation at play here. Abraham disseminates the figures produced by the study without the slightest indication of the study’s methodology, let alone critiquing it. Furthermore, like IER’s Robert Murphy said in 2013, the context-switching use of “subsidy” is a sort of rhetorical trick. 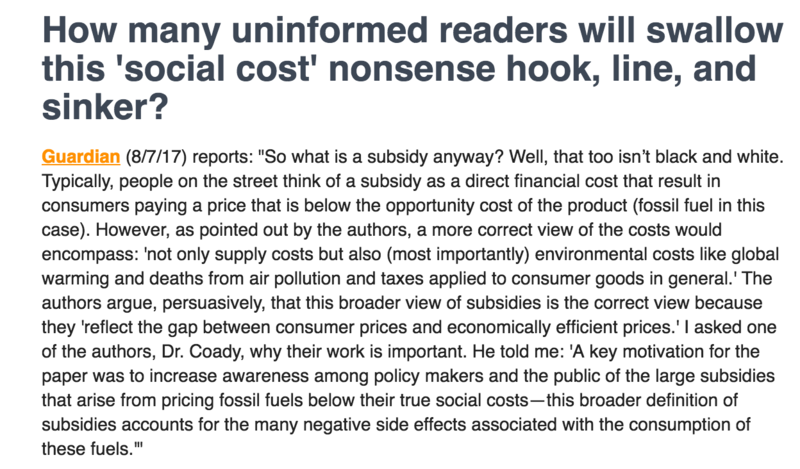 The typical reader, busy with the more pressing concerns of life, will not pursue an in-depth evaluation of the study, but is likely to remember the staggering subsidy claims being made about the fossil fuel industry. And Abraham, of course, knows this. Scientific topics require deliberate thought, but it is all too often omitted from popular discourse on climate and environmental economics. Readers of The Guardian deserve better than to have “close to useless” metrics, like the social cost of carbon, promulgated as ironclad science.